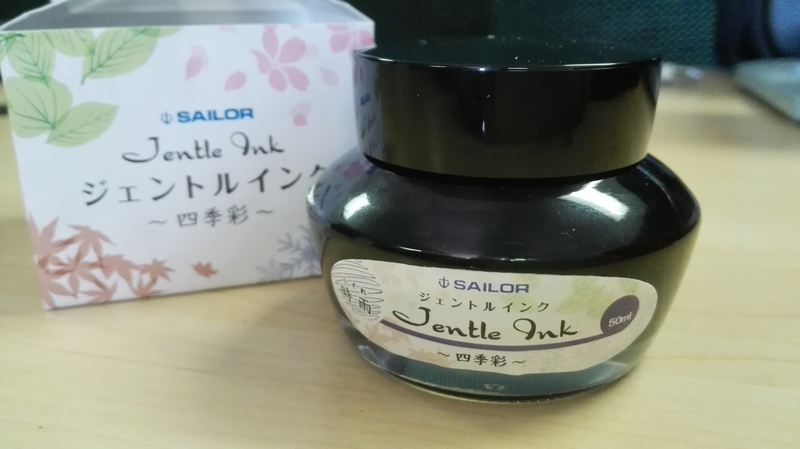 I don’t know why, but I really wanted to wait until I actually purchased my first bottle of Sailor ink before I did a review… Maybe because it comes with a built in reservoir and that’s pretty cool. 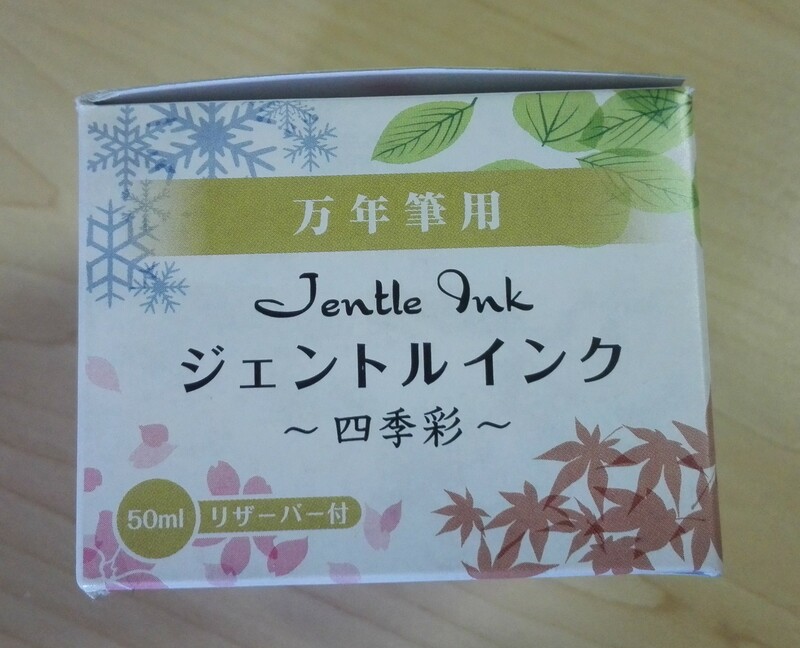 The box is white with the four seasons being represented by images of green leaves, snowflakes, blossoms and brown leaves. 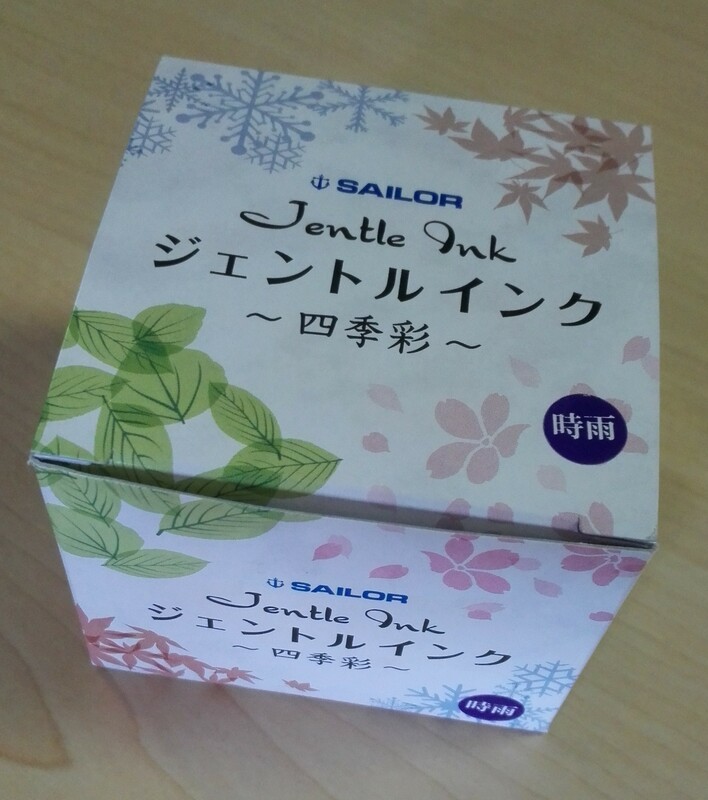 In front and on top is a sticker colour dot indicating which colour is in the box, along with the Sailor logo and Jentle Ink label as well as the milliliters (50ml). 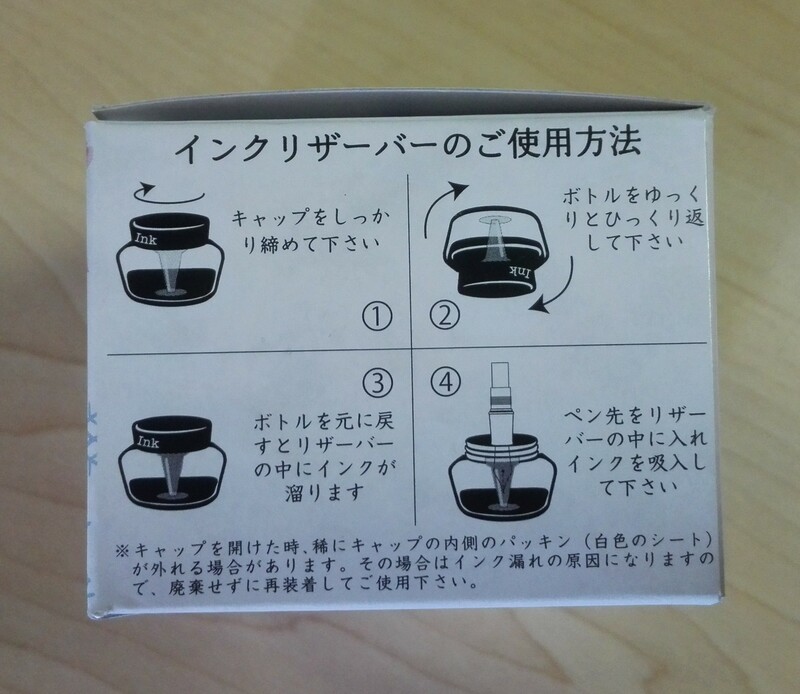 On the one side of the box you also have a diagram showing you how to use the reservoir that’s built into your bottle. 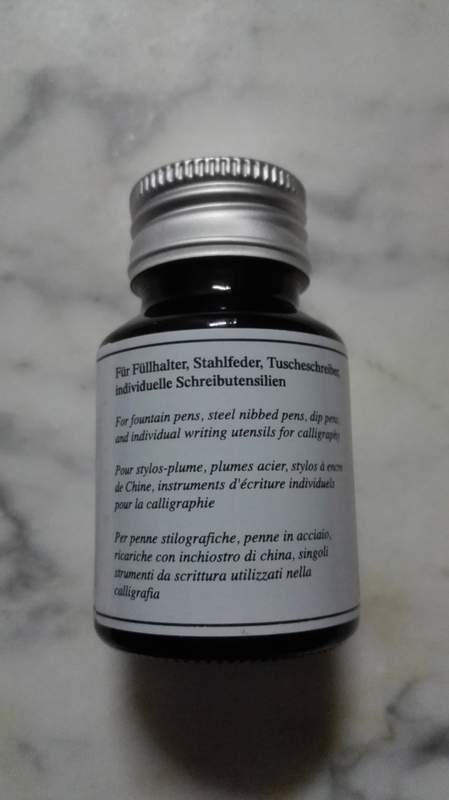 Again no English instructions – but the pictures are very clear and straight forward. 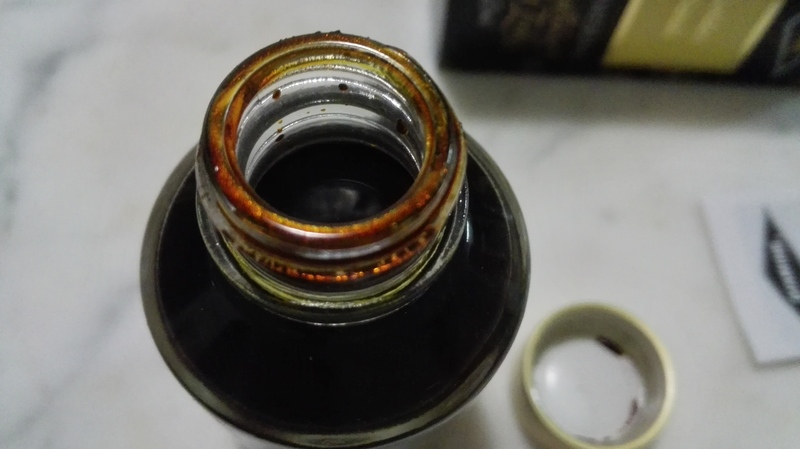 The bottle, is um weird. 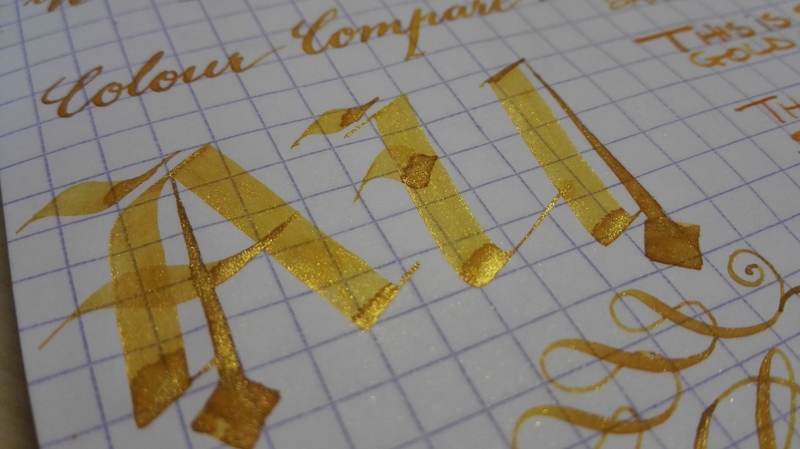 Super functional, and it is pretty but just really difficult to describe. 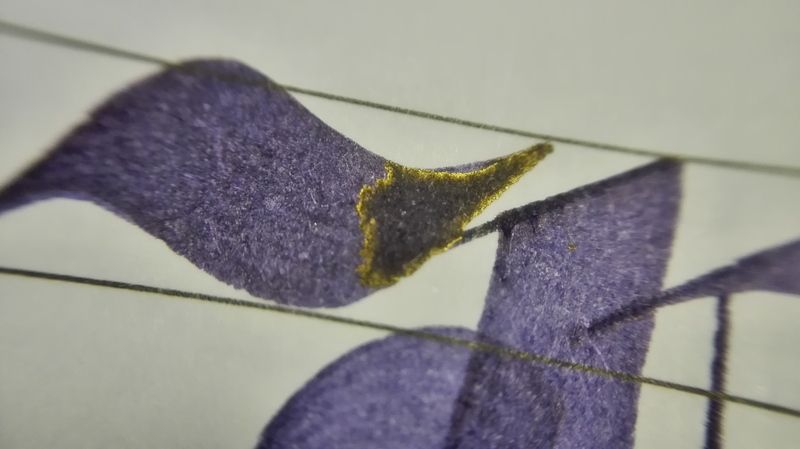 Almost as if you had a cone, and then cut the wide part off, sealed it and then tapered the other end up into a large circle – which then become your lid area. 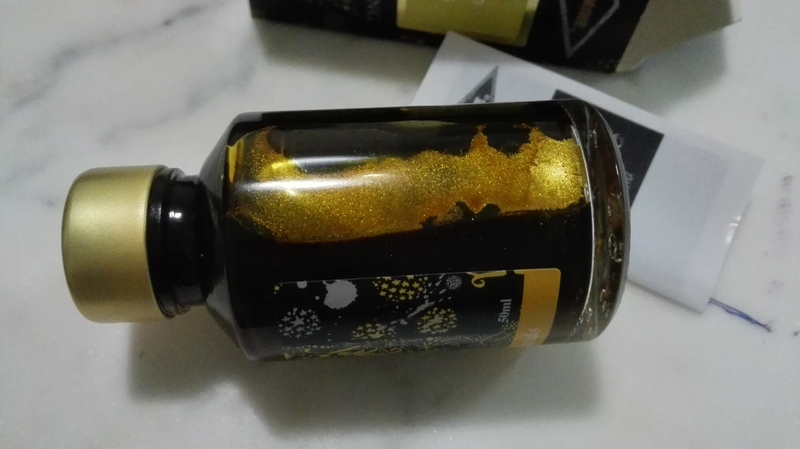 Its also a very short kind of bottle. 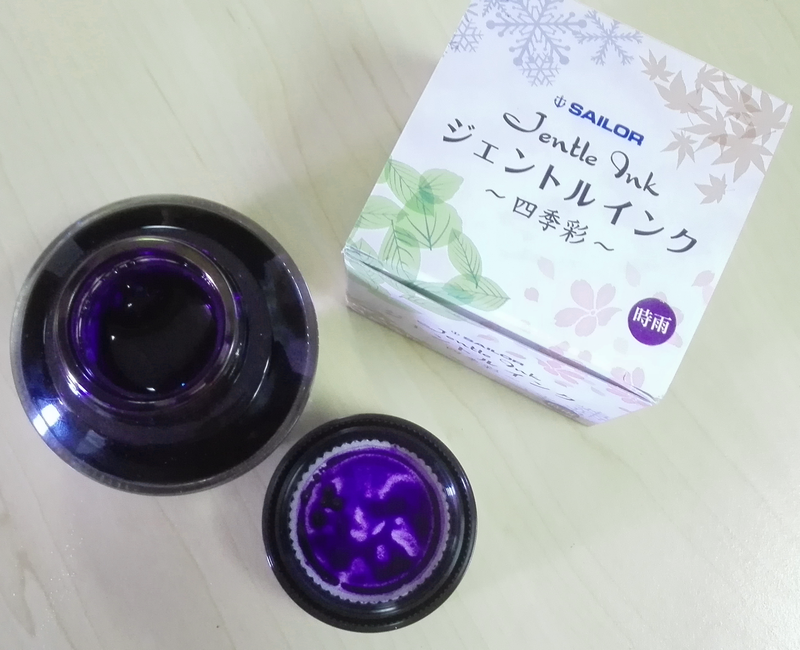 Speaking of the lid, its made from shiny black plastic that hides an amazing large opening with a built in reservoir. 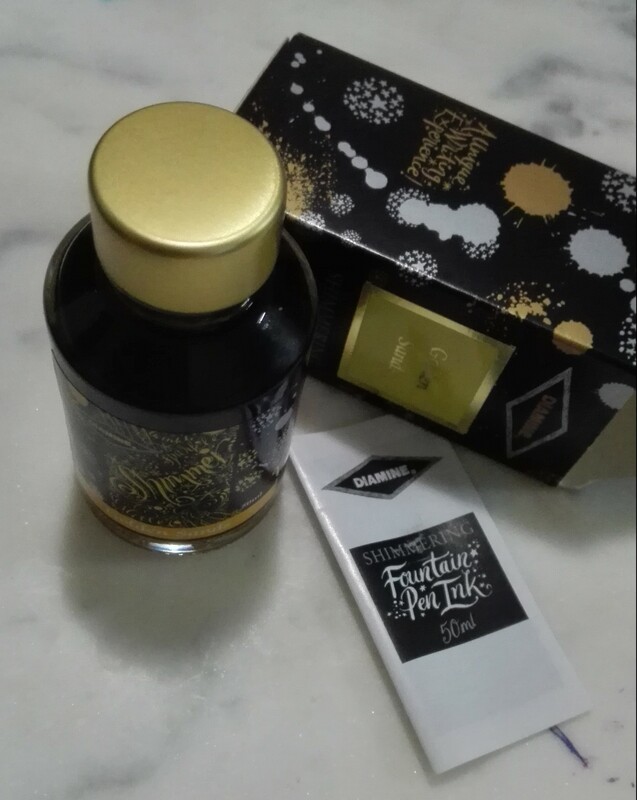 And because the bottle isn’t very tall – filling pens is an absolute pleasure. 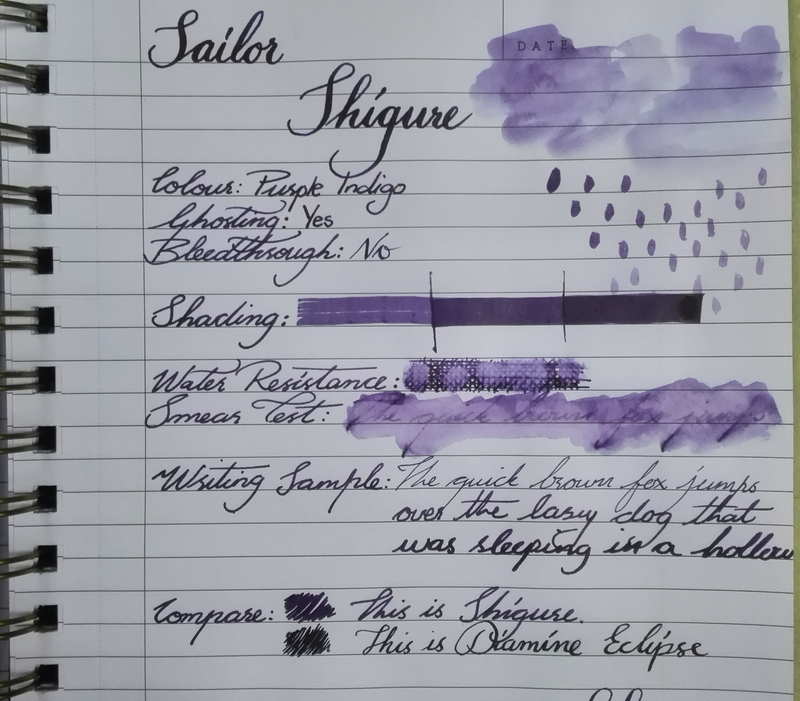 I didn’t expect to like Sailor inks as much as I do, and I defiantly didn’t expect Shigure to be my favorite. 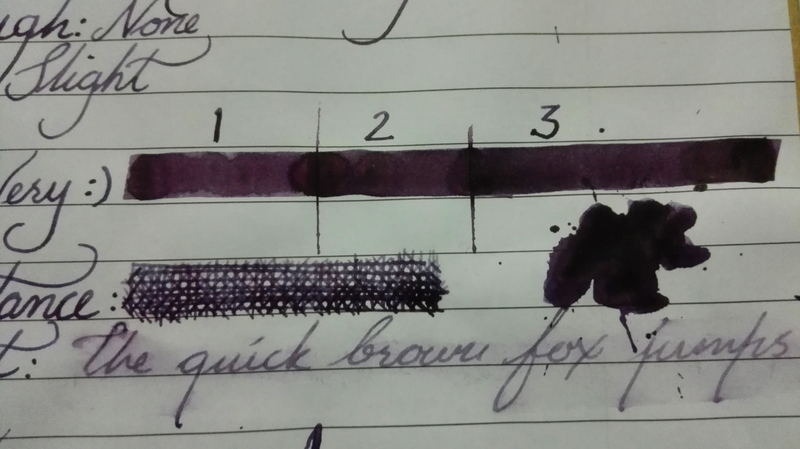 After all its a purple/blue that’s borderline black in very wet nibs. 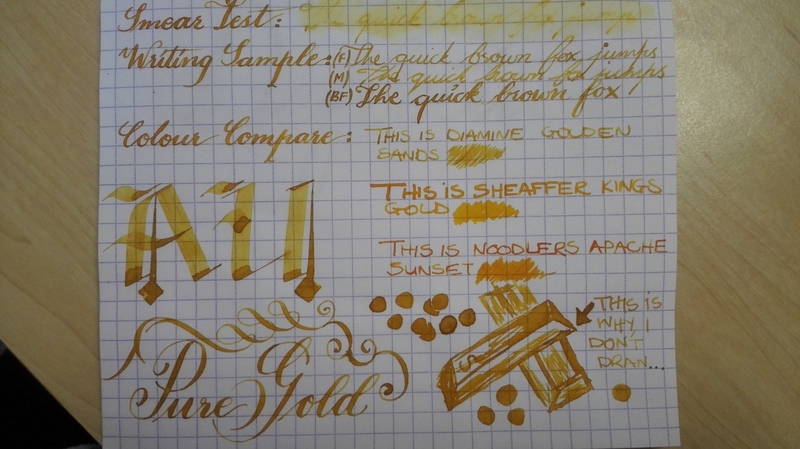 Not exactly my general colour preference when it comes to inks. But I find Shigure to have an old school appeal similar to Rhorer and Klinger Sepia. 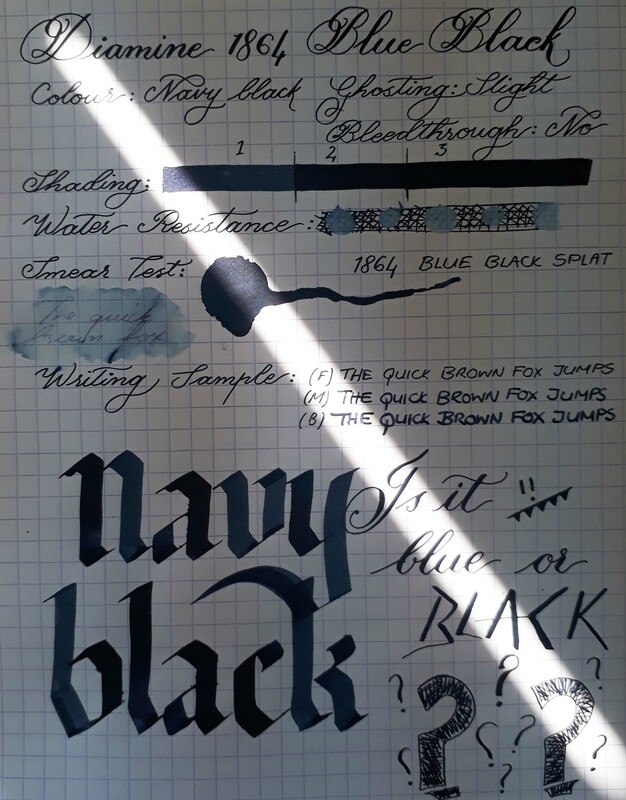 It’s one of those inks that looks like a dark purple on some papers, on others it looks navy and still on others a blue/purple black. 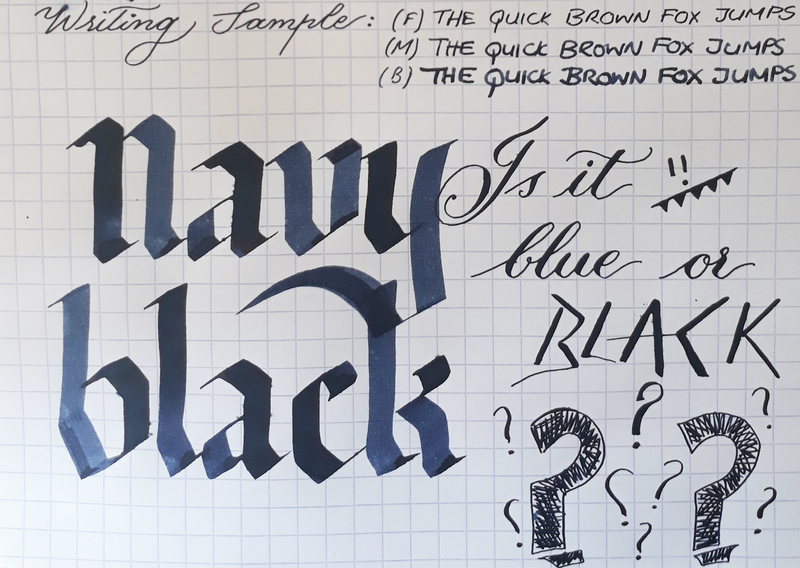 It never truly looks black though, and that’s one of the reasons I enjoy using it so much. 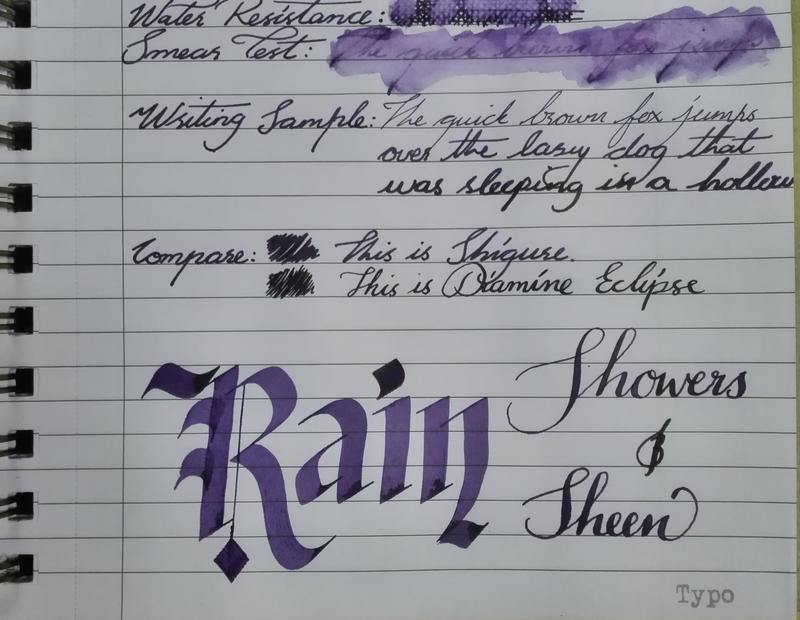 The fact that the name means Rain Showers is just another reason why I love it. 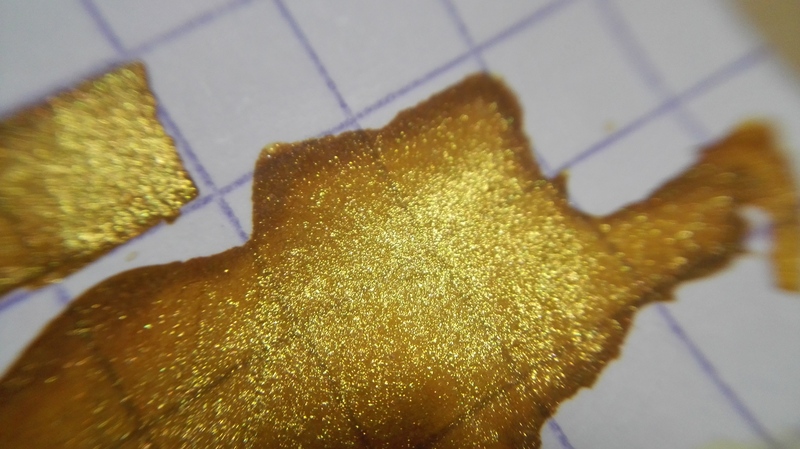 I guess the best way to describe this colour would be a purple based indigo. 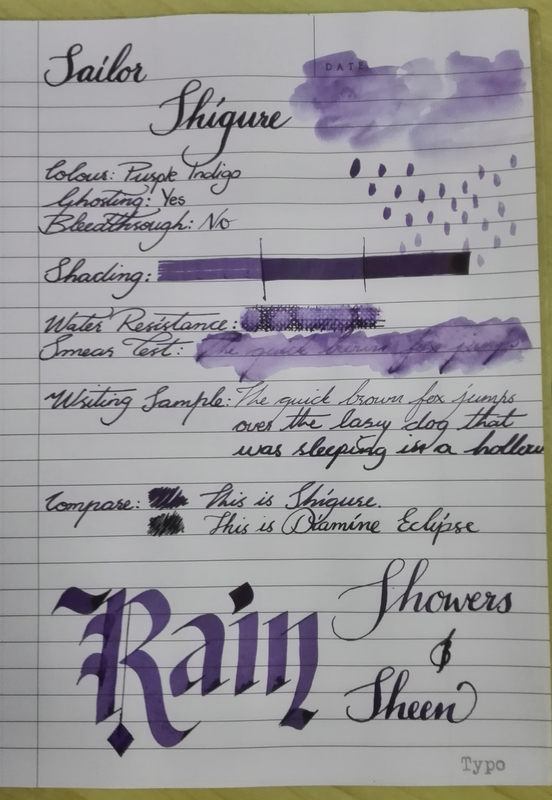 The water resistance is not great, but then again most inks don’t have good water resistance. 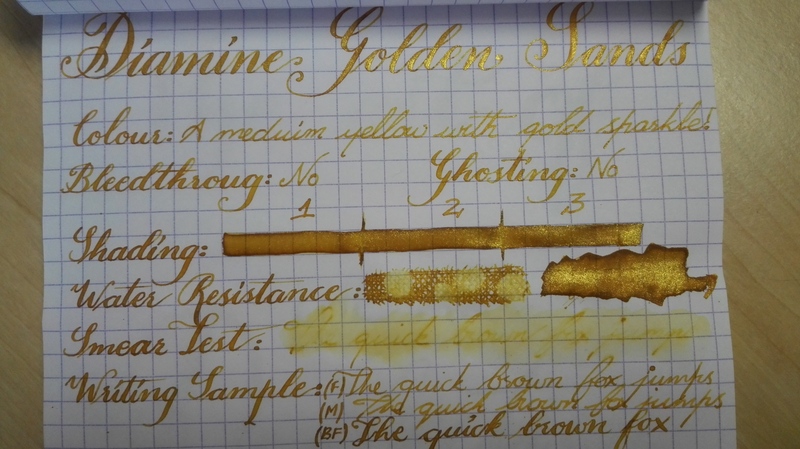 This is a very saturated ink though, you could easily add a little distilled water if you would like to lighten the colour without effecting the flow to much. 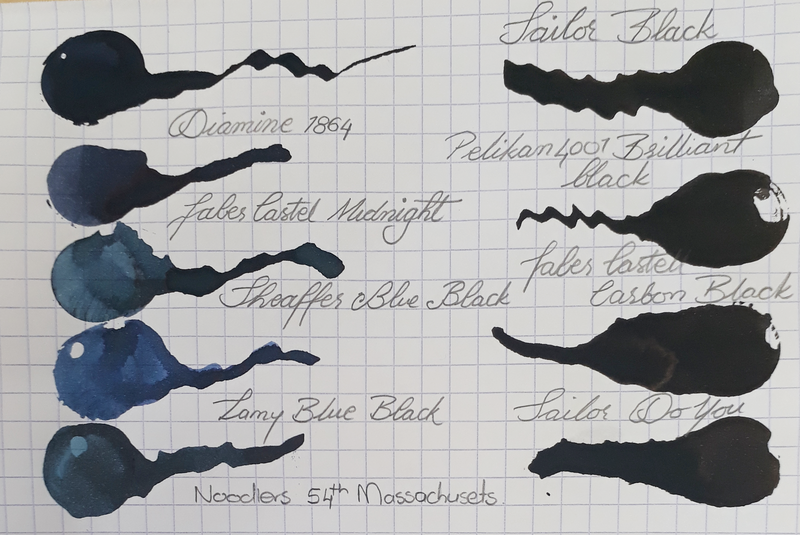 Have any of you tried Sailor inks and what did you think of them? 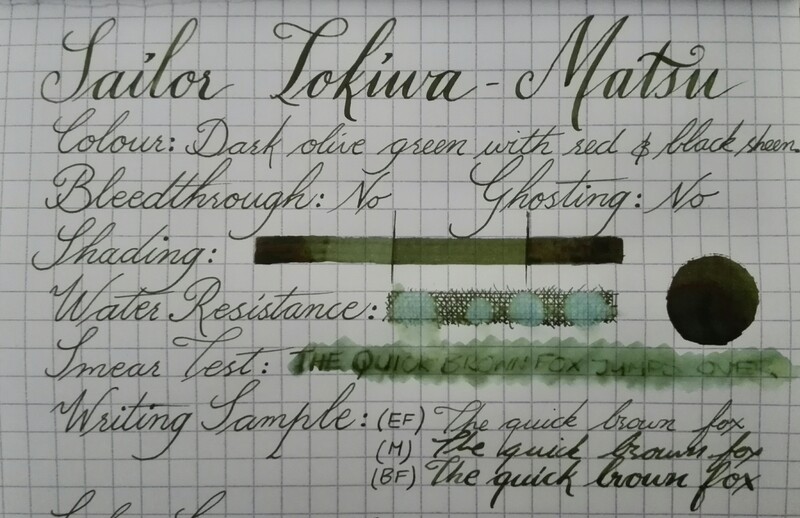 Rohrer and Klingner was launched in SA by Write Gear this last month and I couldn’t wait to give it a try. 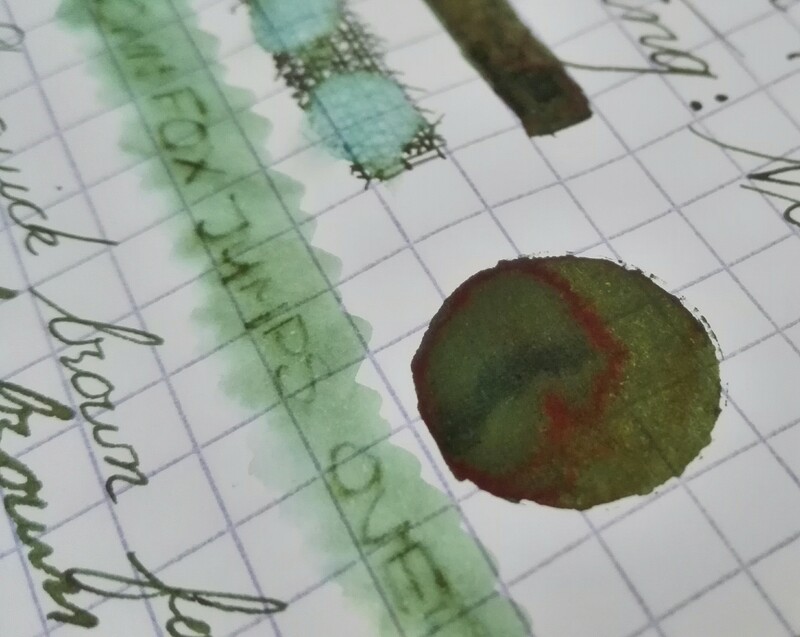 One of the big reasons for this was that this particular brand has two waterproof inks available, Scaboisa being one of them. 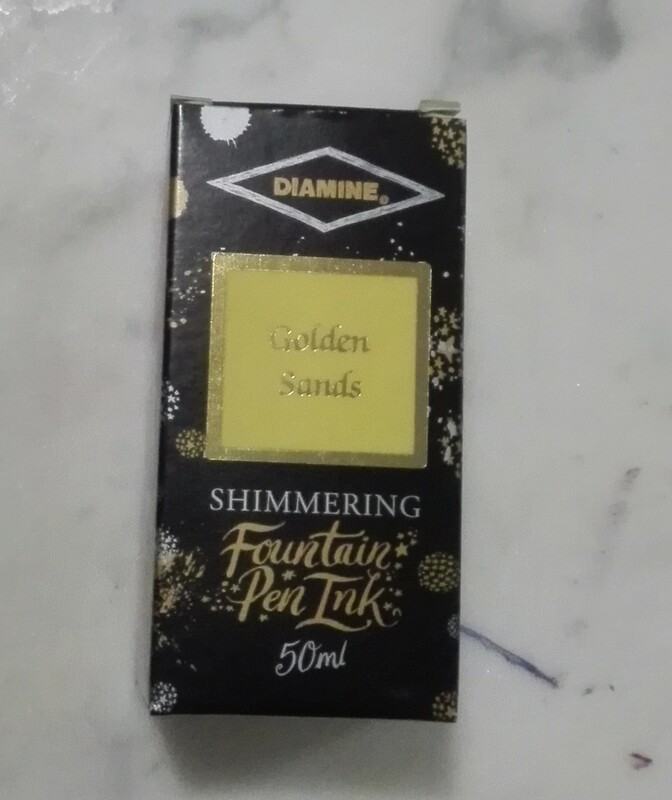 Its a 50ml bottle with a neck that is wide enough to fit my biggest pen, so filling is super easy. 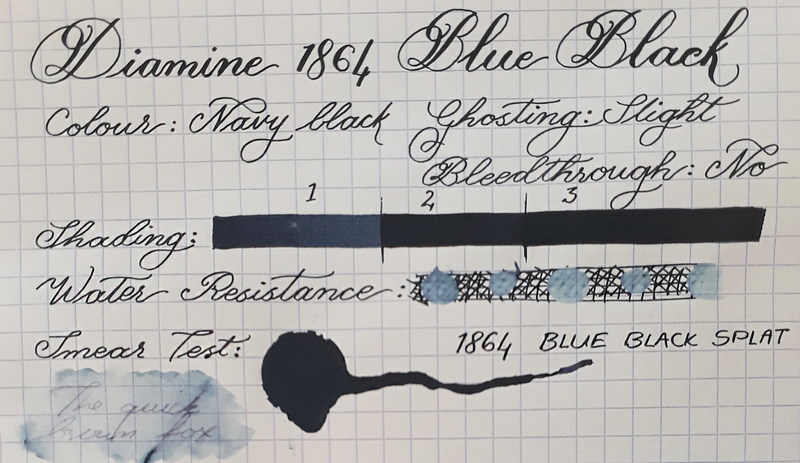 I think this must be one of my favourite ink bottles. 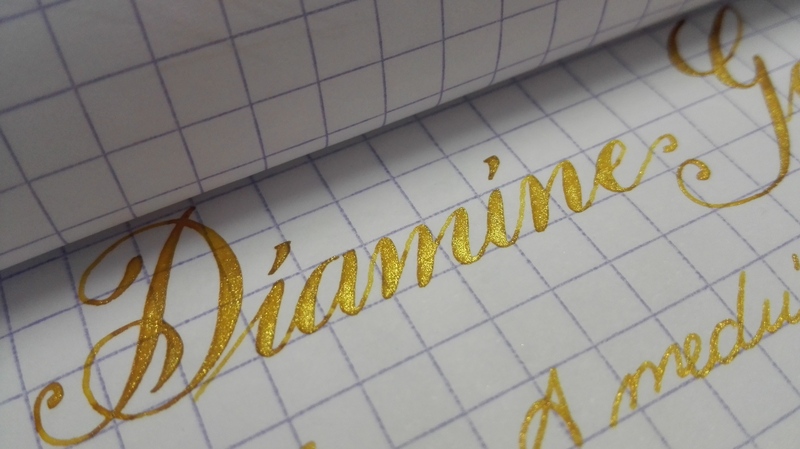 It’s so old school and immediately makes me think of those old calligraphy bibles. 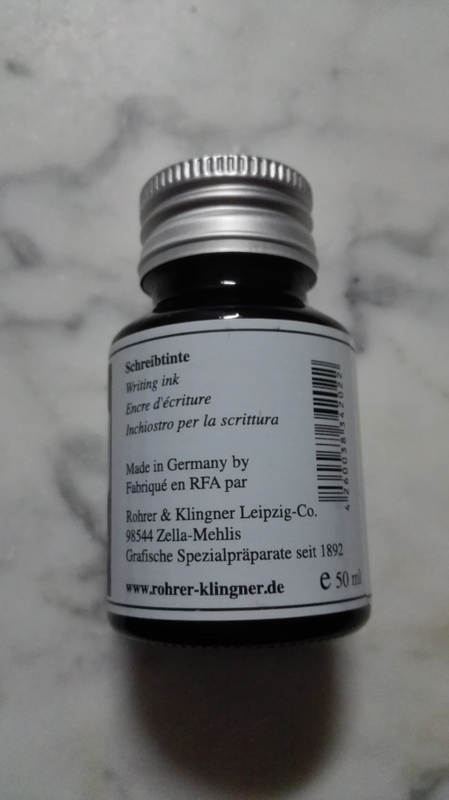 The inks are made in Germany, and the label reflects that all round. 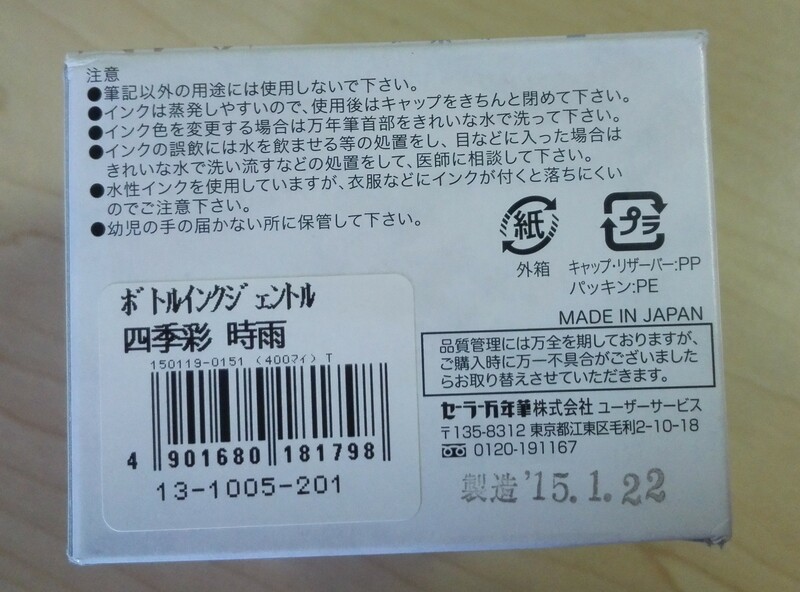 There is also writing in English and what I am guessing is French and Italian. 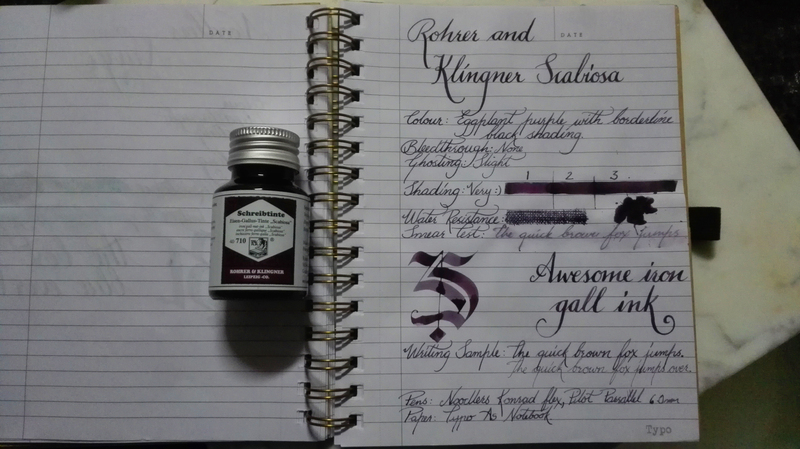 Rohrer & Klingner Scabiosa – back of bottle. 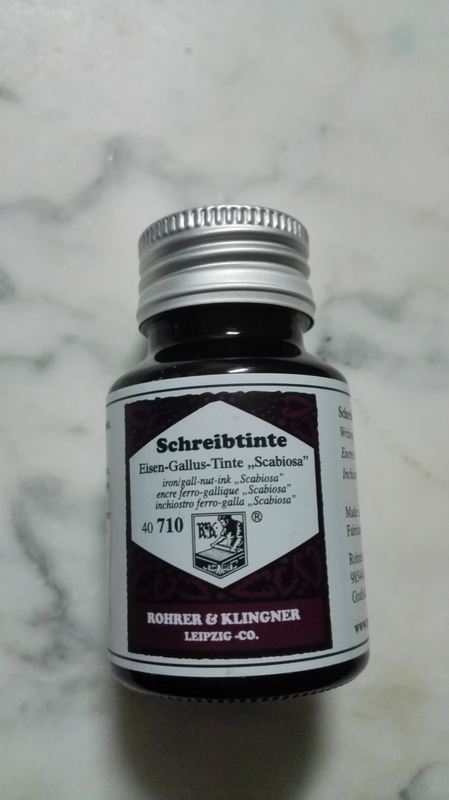 Rohrer & Klingner Scabiosa – front of bottle. 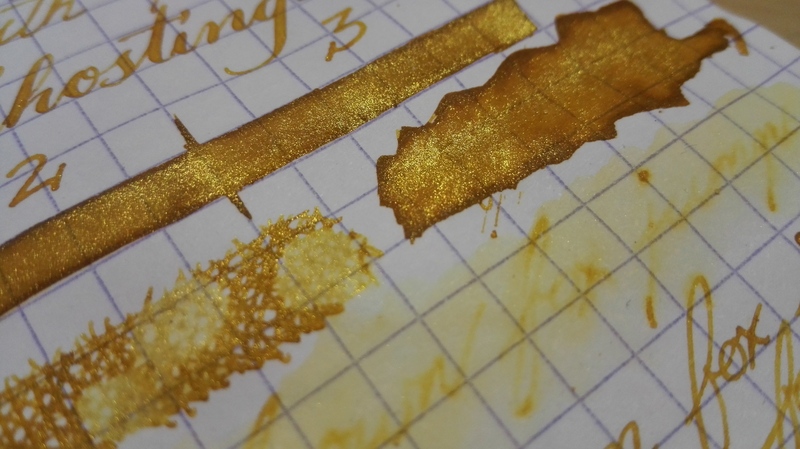 Rohrer & Klingner Scabiosa – side of bottle. 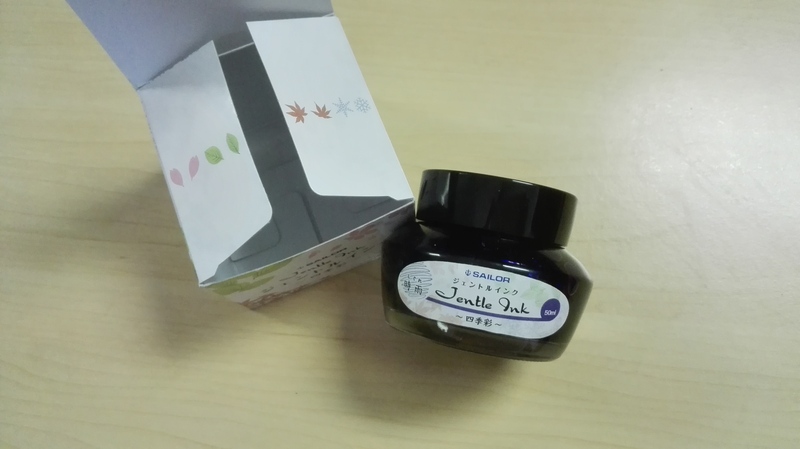 Scabiosa is an iron gall based ink that is waterproof and a hundred percent fountain pen safe! How awesome is that?? 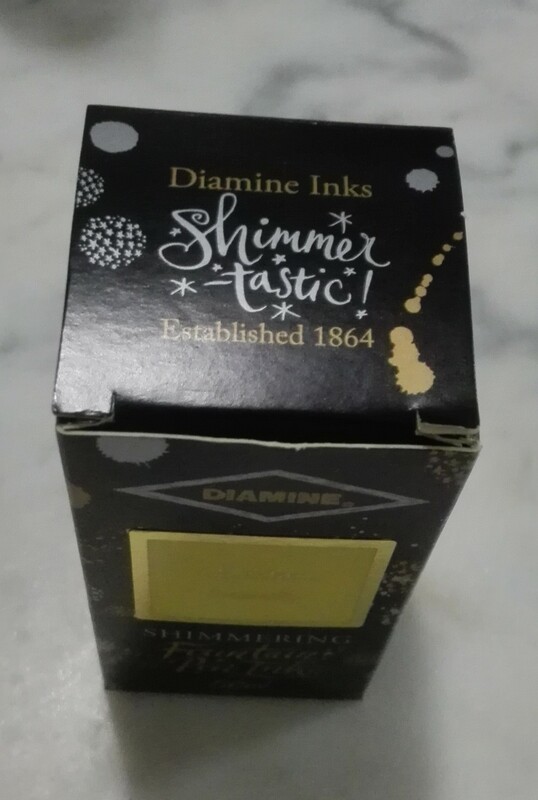 So basically I can finally address envelopes with this ink, and not be afraid that the address will disappear into oblivion. 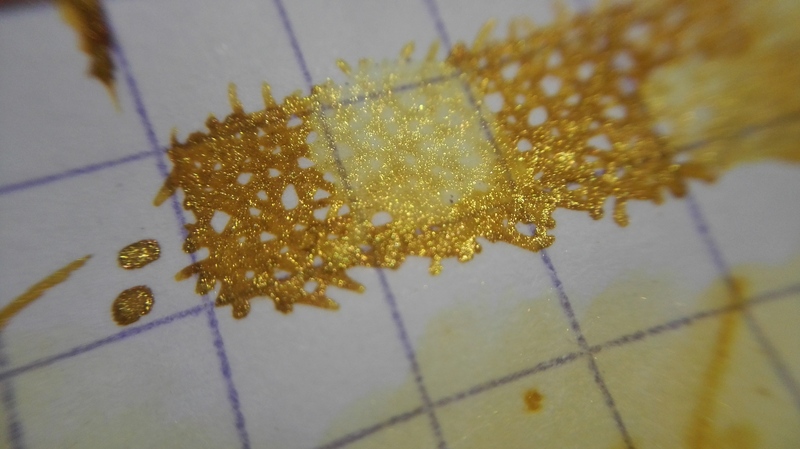 It also helps for those super important notes – i’m unbelievably accident prone – so notes and coffee = no, just no. 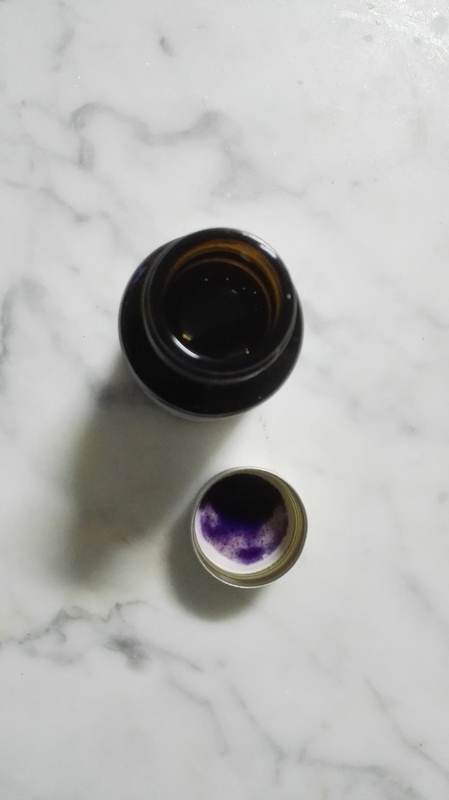 This colour reminds me off eggplant/aubergine skin, it has the beautiful smoky purple colour that shades from light to a really dark and intense purple. 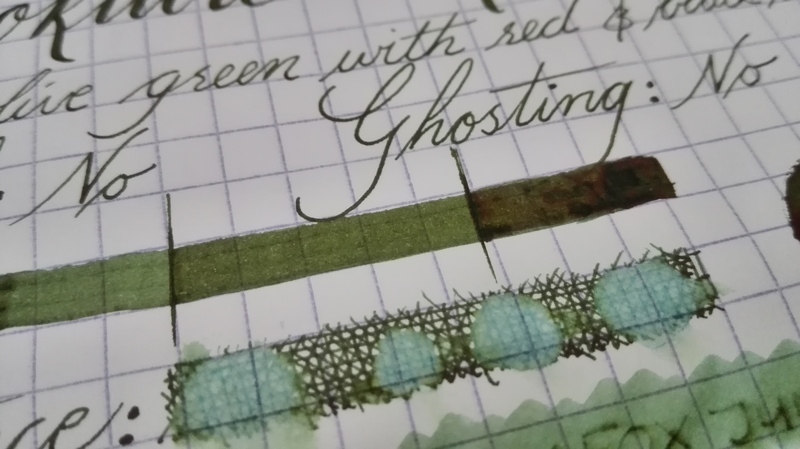 The shading really comes out when using a calligraphy nib. 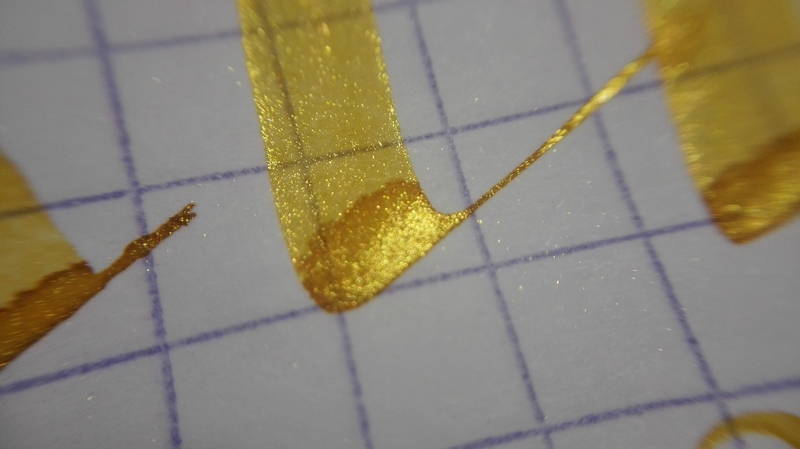 It also writes really smooth, it just seemed to glide out of my pen onto the paper. 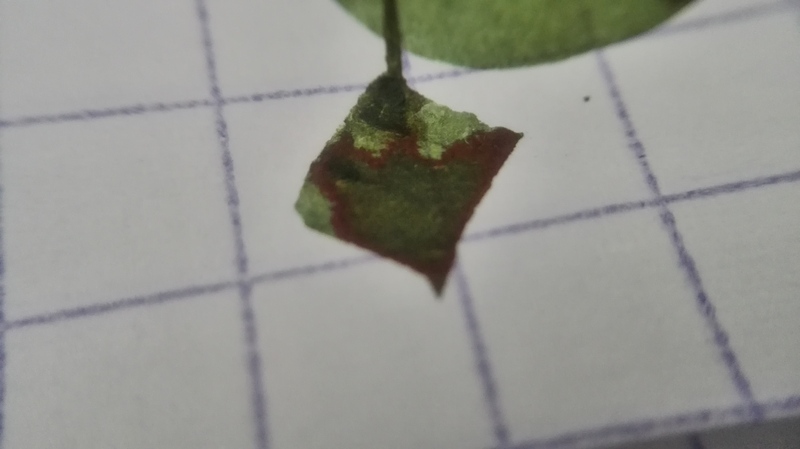 No bleed-through was also a big positive for me. 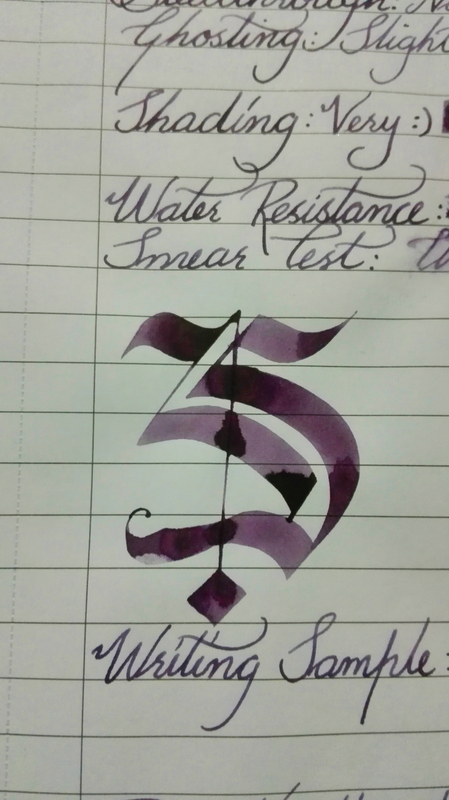 The water resistance of this ink is amazing, a little of the purple washes out, but nothing major. 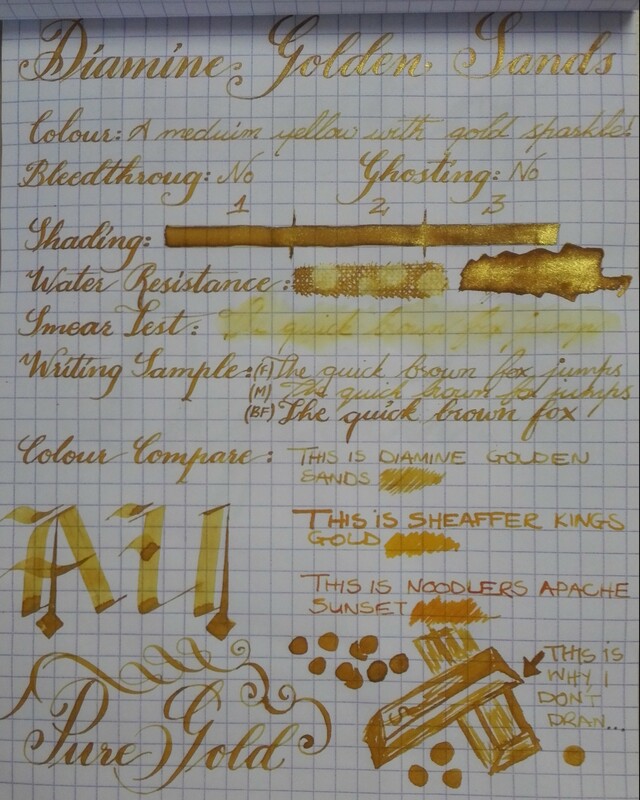 Everything remains perfectly legible. 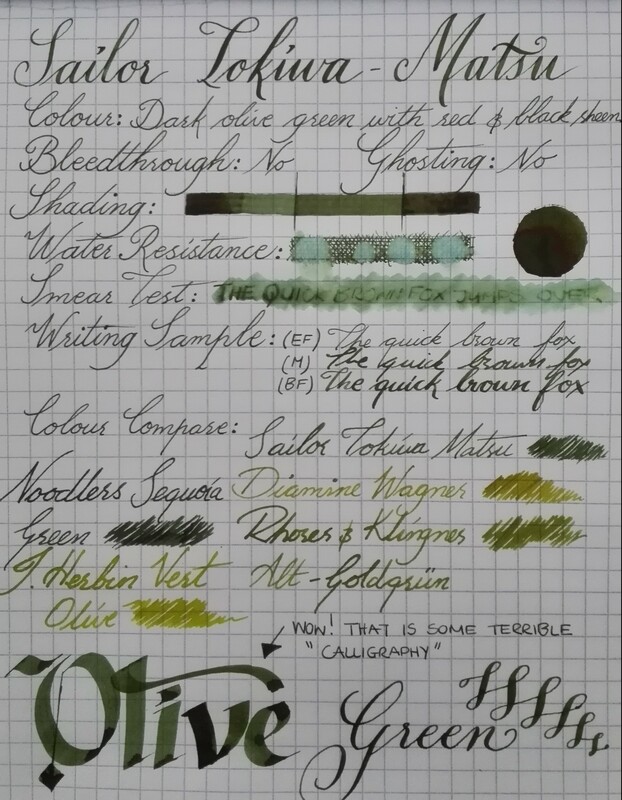 All in all I really like this ink, both the colour and the way it writes. 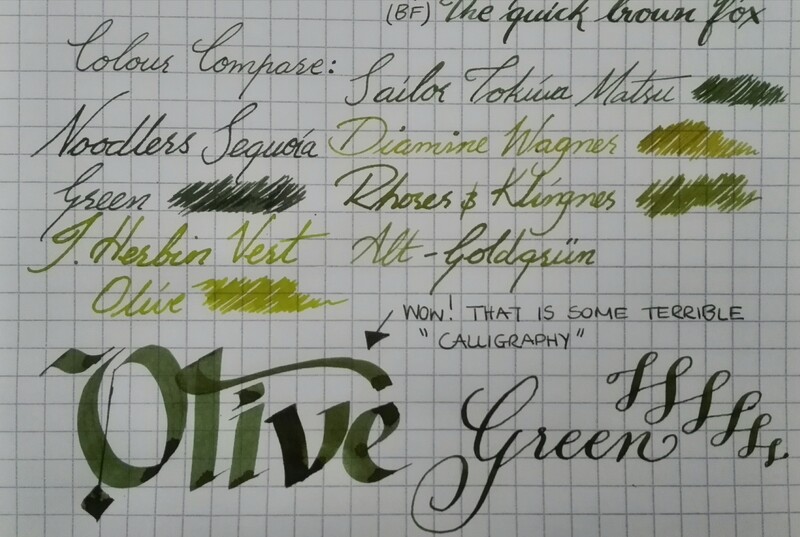 The Rohrer & Klinger range of colours appeals to me as a whole – and if they all write as beautifully, its a brand that will be quite high on my recommendation list.